If you’ve been following along, I’ve been on a mini mission to think of small ways that we can differentiate in our classrooms without having to create giant projects. While giant projects are useful, they just aren’t practical day to day. At the end of class for some great share time, the teacher can draw a random name and have the student write or read one of their statements. You could strategically choose one as well. At that time the students try to figure out if it is a true or false statement. Switch up the problem daily or every few days to keep it fresh. It could be a number, a shape, money, an equation, etc. 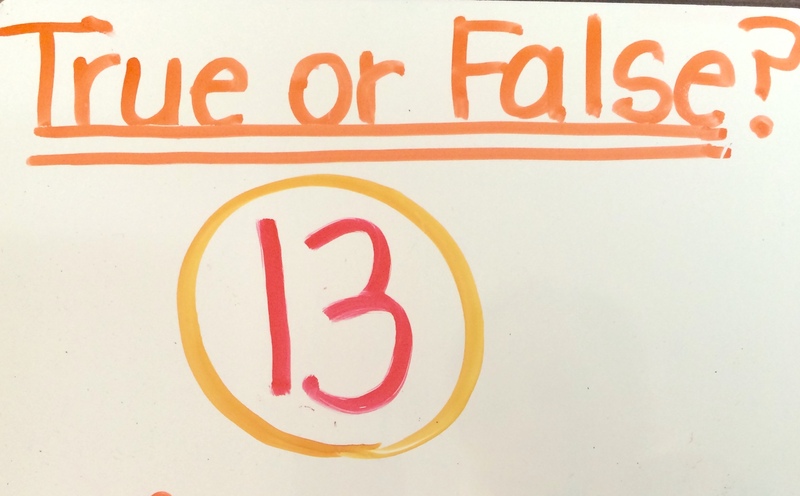 When the students try to figure out if it is true or false, they should explain their thinking. For example, in the one above, give them time to turn and talk with each other about how to make it a true statement. This is something that they can work on whenever they finish something early! This should be a quick closure to a lesson, or even just a quick review in anticipation for the next day. It should not turn into a long teaching 25 minute teaching moment. Sharing the statement at the end can be about 2 minutes! This isn’t meant to be graded. We don’t grade every single thing students read, so it is okay to let go of grading every math thing they do as well! Take the pressure off of yourself! This is all about the thinking. 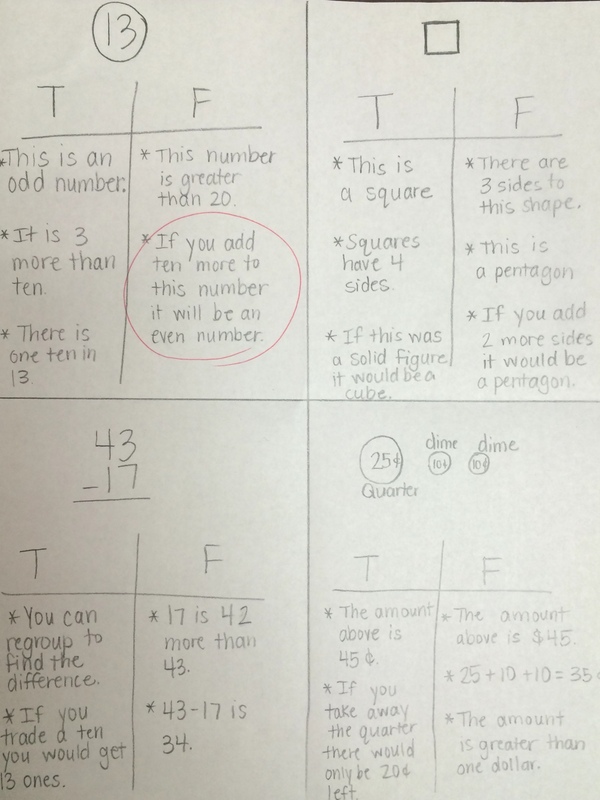 The whole idea of this is to promote the idea of thinking (hello math practice standards), reasoning and writing about math. We want them to use precise language and to expand their thinking. The second graders today just ate it right up! Maybe your class will, too. When I was an elementary student, fractions were by FAR my most difficult subject. I could not ever wrap my brain around them and embarrassingly enough, I still struggle to understand them. The other day I had trouble trying to figure what half of a 3/4 cup of butter would be! My cookies tasted a little more buttery than I would have liked. 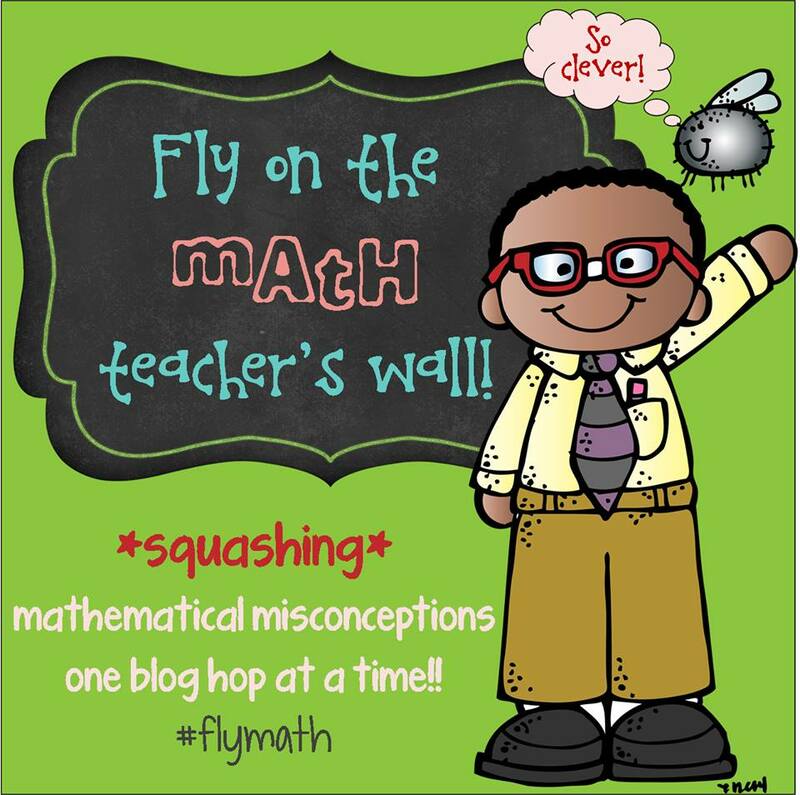 So today I am talking about misconceptions about fractions, because I’m really a pro! 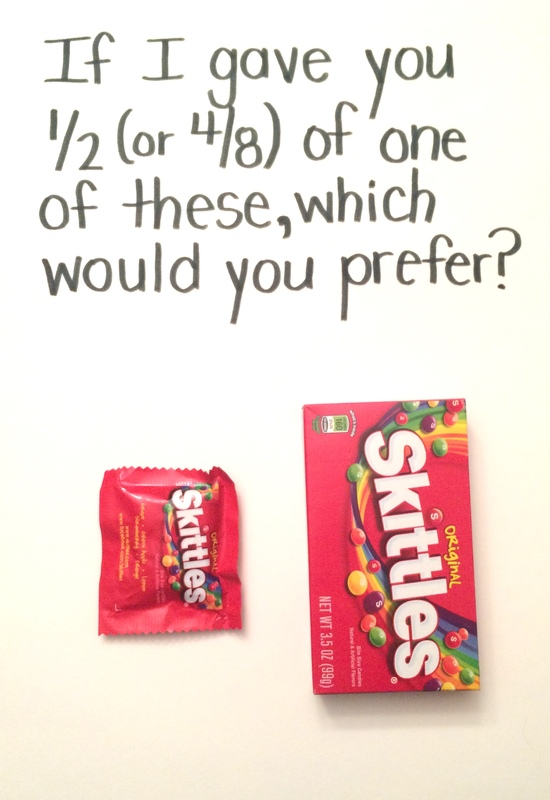 This question was on a fourth grade test on fractions this week at one of my schools. So somehow, somewhere we have a misconception here. 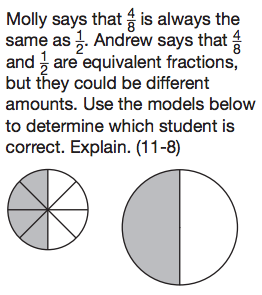 Students are missing the idea that fractions can be different amounts if the whole is a different size. After all, one 8 inch pizza is not the same as one 16 inch pizza, right? I’d MUCH rather eat 1/2 of the 16 inch pizza! My favorite way to clear up misconceptions is to relate it to real life…especially food. Food lends itself beautifully to math in so many ways. Once I brought in the skittles, suddenly light bulbs turned on. Equivalent fractions may be the same number, but they are not always the same amount. I think we miss this step very often when we work with students. I think that real life connection is what helps them figure out what the symbols stand for. When we leave that out, students are unable to make sense of a problem. My favorite thing about math is that is a messy thinking subject. It is a learning subject. It should be messy and full of questions. We need to teach kids that it can be glorious when it suddenly is no longer messy and the patterns and the discoveries are right in front of our faces! We have to model this for students, and more importantly we need to give them opportunities to make math a learning subject. So often we want to give all the answers, and tell them all the patterns, and show them how magical it is, that they lose their passion for discovering math at an early age. They begin thinking that math is a performance subject…teacher asks the question, student gives the answer…25 times in a row…on a worksheet. Instead we need to give students meaningful explorations that can often run in the background of the school day. 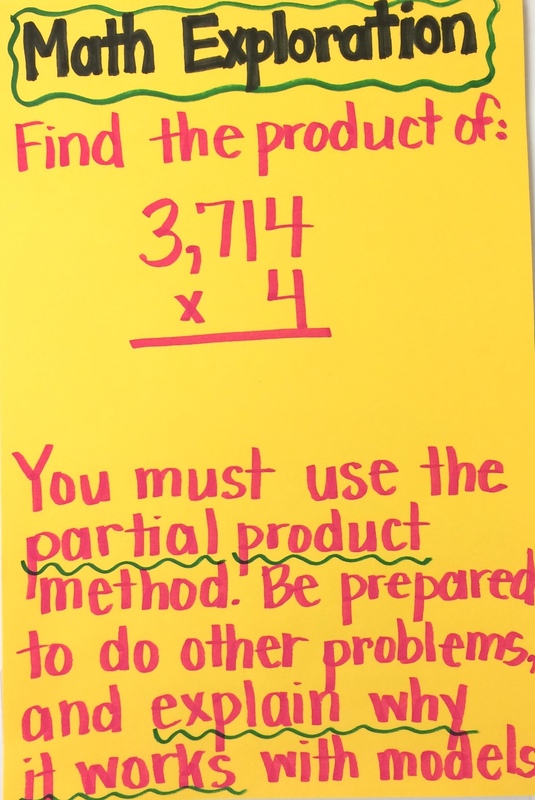 These can often be very simple, and they really allow for differentiation. Some students will take these explorations much further than others. Give enough time for the exploration. This one will be 2 weeks. Tell them to work with each other! Isn’t that how we learn best? The second we want to know something we email, text or call someone. Let them teach each other. Be sure that they understand that the most important part is not the answer they give you, but rather the method they use to solve it and WHY IT WORKS. That is the number one most important thing that they can get out of this inquiry activity. Will all of the students be able to do this? Possibly…their level of understanding will vary from student to student. But in the end, when you bring them all together let the students do the talking. 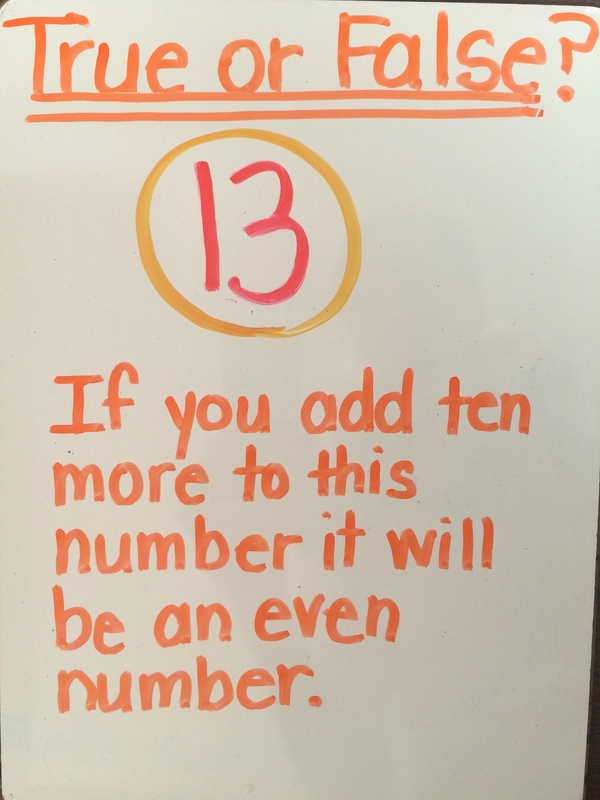 They will get there, if not now…they will have some prior knowledge for 4th grade.